…because all things start at the table. 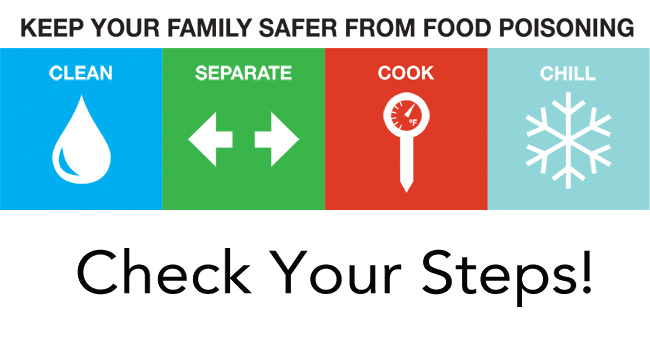 Food safety starts at the grocery store: Be sure that you keep your raw meats separated from prepared foods and produce in the shopping cart. Put an ice chest in the back of your vehicle to store cold items for the ride home. Pack in ice if you have a long way to go. If you are only traveling a short distance, an insulated shopping bag may do the trick. Store vegetables and prepared foods on shelves that are higher up in the refrigerator. Store raw meats on lower shelves. Refrigerate or freeze cold foods immediately when you get home. Refrigerate leftovers within two hours of cooking. Wash all produce before preparing and eating– Even fruits with a rind. Cantaloupe and watermelon can harbor bacteria in and on the rind. As we cut through these with a knife, we can potentially spread that bacteria into the parts of the fruit that we eat. Just give it a wash! Be sure to use a meat thermometer to check the temperature. Don’t rely on color for safety! Last safety tip: WASH YOUR HANDS BEFORE COOKING, AFTER HANDLING RAW MEAT, AND AFTER COOKING!! CLEAN- Wash all vegetables and fruits, including those with a rind. Also be sure to sanitize counter tops and surface areas that come into contact with raw meats. Wash hands often. 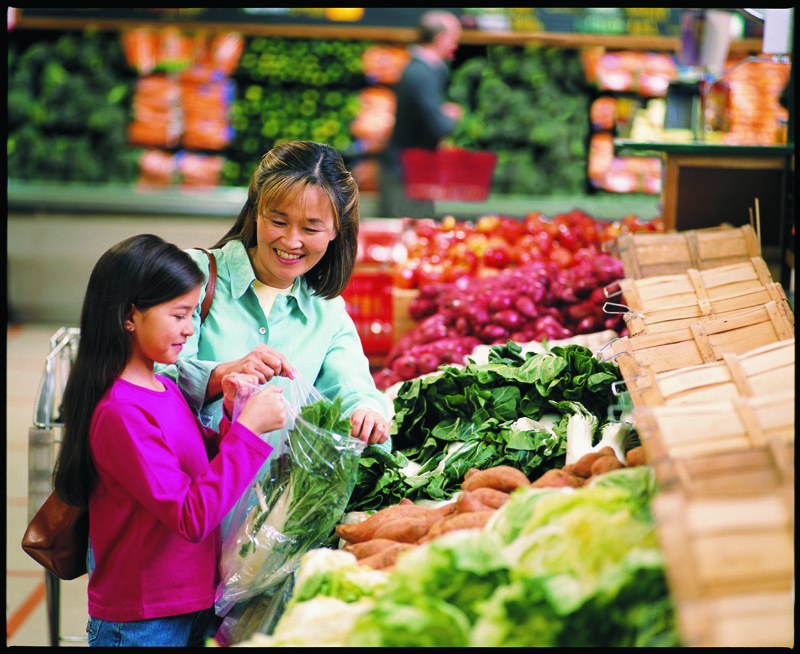 SEPARATE- Keep raw veggies/fruits and prepared foods separate from raw meats in the shopping cart and in the fridge. Meats below, veggies/fruits and prepared items above. COOK- Use a meat thermometer to check the temperature of meats using the guidelines listed above. CHILL- Refrigerate foods as soon as you get home from grocery shopping. Refrigerate leftovers within two hours of cooking. Yesterday I told you about the good things in milk. The nine essential nutrients found in milk are calcium, protein, niacin, vitamin A, vitamin B-12, riboflavin, phosphorus, potassium, and vitamin D when fortified. Today I would like to explore the myths scare-tactics I have seen recently on my social media news feeds. Scare Tactic #1: Milk has the same calorie load as soda. A cup of of reduced fat (2%) milk has 122 calories and a twelve ounce can of soda has 136 calories. That’s true- but milk has 37 empty calories where soda has 126 empty calories. Empty calories are calories consumed with no nutritional value. The empty calories in soft drinks mostly come from excess sugar or high fructose corn syrup. The empty calories in milk come from the milk fat. If you chose skim milk, the amount of empty calories would be zero. I realize that not everyone drinks 2% milk. Here are the calorie counts of other milk options: one cup of skim milk provides 83 calories with zero from fat; one cup of 1% milk has 102 calories, 18 of those from fat; one cup of whole milk (most likely to be fortified with vitamin D) will give you 149 calories, 63 from fat. I actually saw one “shock photo” on Facebook that claimed a glass of milk contained 300 calories. What size glass are they using? Even with whole milk, that would be two glasses worth of calories. I say this to illustrate the point that we all need to ask “Who is distributing this information?” and “Why?” The profile distributing this particular bit of info is actually a company that produces vegan products. They stand to make a profit if people decide to switch from dairy milk to a vegan alternative. Scare Tactic #2: High milk consumption is linked to higher rates of type 1 diabetes. What counts as “high?” The USDA recommends that Americans consume 24 ounces of milk per day- that’s three cups. This scare tactic never really comes forward with its true meaning. How many cups is considered high? I would assume that “high” meant more than recommended. I would also go out on a limb and assume that people who regularly consume more milk than the recommended amount also consume more of other foods than the recommended amount. It is very likely that higher rate of type I diabetes is more linked to excess calorie consumption than milk consumption. Side note: I could not even find the original source of this claim. When I clicked the link I was taken to a blog that says they share interesting things found on the internet. So, basically it linked back to someone who didn’t actually write it, and probably didn’t know who the original source was. Scare tactic #3 No other animal consumes the milk of another animal, or consumes milk into adulthood. Well, no other animal walks completely erect on two legs, either. The human body needs the calcium so readily available in milk to make sure that our skeletal systems can support the weight of our bodies in an upright position. That makes us different from other animals. Also, I’m not sure other species wouldn’t drink the milk of another animal. (Dogs and cats will drink cow’s or goat’s milk when offered.) It’s just that humans are the only animal that has been able to procure milk from a different species on a regular basis. Scare Tactic # 4 One third of adults are lactose intolerant. An enzyme called lactase is required for the breakdown and digestion of lactose found in diary products. It is true that the body’s production of this enzyme slows down, and for some, stops in adulthood. This is not true for everyone. If you are lactose intolerant, you should not consume lactose. BUT lactose intolerance does not decrease the need for the nine essential nutrients listed above, and the fact that my neighbor is lactose intolerant is not really a valid reason for me to conclude that milk is bad. For those who are lactose intolerant, there are lactose free milk-substitutes. They cost quite a bit more than milk, and in my opinion, do not taste very good. What you choose to consume is up to you, but it is important to know the truth. The information in the table above is generic. Each different brand of milk alternative will have slightly different ingredients and nutrition facts.The main ingredients of these milk substitutes (soy, almonds, and coconuts) do not naturally contain all of the nine essential nutrients that milk has, so you should read the labels before making a decision. If you are not familiar with nutrition labels, check out my friend Amanda’s blog on reading nutrition labels. Milk really does do a body good. Calcium: One 8-ounce serving of milk provides 30% of the calcium recommendation for a day. Calcium helps build and maintain strong bones and teeth. This mineral also plays an important role in nerve function, muscle contraction and blood clotting. Protein: The protein in milk is high quality, which means it contains all 9 essential amino acids or “building blocks” of protein. Protein builds and repairs muscle tissue, and serves as a source of energy during high-powered endurance exercise. An 8- ounce glass of milk provides about 16% of protein you need in a day. Niacin: Niacin helps enzymes in the body, and is involved in the metabolism of sugars and fats. A glass of milk contains 10% of niacin needed in a day. Vitamin A: A glass of milk provides 10% of the Daily Value of vitamin A. This nutrient helps maintain normal vision and skin. It also helps regulate cell growth and maintains the integrity of the immune system. Vitamin B 12: Vitamin B12 helps build red blood cells that carry oxygen from the lungs to working muscles. Just one 8-ounce glass of milk provides about 13% of the Daily Value for this vitamin. Riboflavin: Milk is an excellent source of riboflavin, providing 24% of the Daily Value. Riboflavin, also known as vitamin B2, helps convert food into energy – a process crucial for exercising muscles. Potassium: Potassium regulates the body’s fluid balance and helps maintain normal blood pressure. It’s also needed for muscle activity and contraction. By providing 11% of the Daily Value of potassium, milk contains more than the leading sports drink. Phosphorus: Phosphorus helps strengthen bones and makes energy in your body’s cells. Providing 20% of the Daily Value, milk is an excellent source of phosphorus. Vitamin D: When fortified, a glass of milk provides about 25% of the Daily Value for vitamin D. Vitamin D helps us absorb calcium and build strong bones. Vitamin D also helps control body fat. Anti-dairy groups are currently using social media scare-tactics to discourage people from drinking milk or giving milk to children. These scare-tactics are often in the form of photographs and memes with outrageous captions that either tell only a very small portion of the truth, or are completely untrue. Join me at the table next week. I will be addressing the scare-tactics often used on social media.